I tried surfing once. And got surfed. The water up the nose, sand in my scalp, thrown-down-turned-up-side-down kind. I gave up. So when I met Farhana Huq, a 30-something woman of Indian descent who told me she could surf, I had immediate respect. 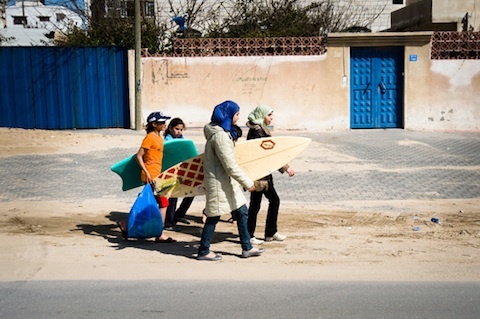 When she told me about Brown Girl Surf, her project to tell stories of women around the world overcoming cultural barriers to surf, I was intrigued. Then, when Farhana described a journey she was taking to India and Bangledesh this fall to meet some of these bold young women, the words unexpectedly stumbled out of my mouth: "I'm coming with you." When I was 5 years old, I once let go of my dad's hand on the side of a roadway and bolted across the path of an 18-wheeler. I'll never forget the terror of that crossing. Or the scolding I got afterwards. But also the thrill. Of doing something I was told I couldn't. Of feeling the fear and using the energy of it to get across the street before the truck could hit me. In my adult life, I've stopped leaping into paths of oncoming vehicles, but have continued to cultivate my relationship with those fearful feelings that stop me in my tracks, send my heart pounding and those "YOU CAN'T! YOU CAN'T!" sirens off in my head. I felt them when I left the U.S. for 10 months with a giant backpack and one-way ticket to Argentina in my hand; when I flipped out of a plane 12,000 feet in the air on my first sky dive; when I walked into a Florida courthouse to file divorce papers alone; and every time I feel tears welling up behind the words of the most vulnerable things I have to say. On the other side of all of these experiences have been great thrills, adventure and triumph. The best experiences of my life. In my work with Storytellers for Good, I come across dozens of organizations doing amazing work in great need of a promotional short film. They're often stories about people addressing challenges like extreme hunger, homelessness and other inequalities. And, at least once a year, moved by the wisdom, compassion and selflessness these stories have to teach, I'll volunteer my time to tell them. When I met Farhana, she told me about women in places like the Gaza strip surfing amongst dropping bombs and flying bullets. She showed me images of others surfing with head scarves and sarees. And it struck me that these stories were equally important to tell. They embody fearlessness. These are women challenging not just the extreme uncertainties of the ocean, but also societal expectations and themselves. 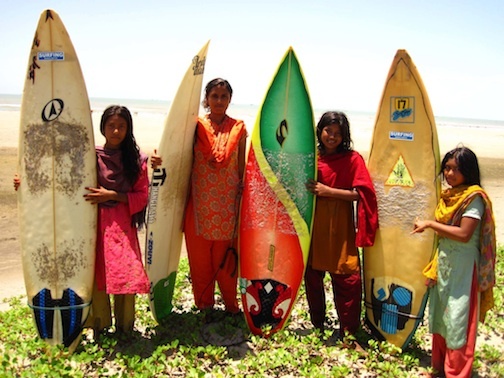 Nassima of Bangladesh started surfing as a teenager despite being homeless and ridiculed by people who told her surfing was not for girls. She battled the waves along with extreme poverty and violence on her way to becoming a surfer who, at times, has beat out the boys. Ishita of India grew up afraid of the ocean and spent two years learning how to swim in it. Despite her parents inability to understand, she sold everything she had to buy her first surf board and now runs her own surf school. "Here we live in a male dominated society," she told me via a Skype interview. "The fishermen are the ones who go out to the sea. The women don't belong in the sea. The women are expected to just sit at home and cook and clean. In time that will change. We also need a place in the sea because the sea is for everybody." This fall, I am joining Farhana on a one-month adventure through the west coast of India and Bangladesh to meet girls like Nassima and Ishita who are challenging both societal stereotypes and their own physical limits to do what they love. We plan to use the short form documentaries we'll create as educational tools to speak on topics of female empowerment and risk taking in diverse cultures. As I look toward packing up my life and business for a month, investing my own money into the trip and getting back on a surf board, I at times experience some of those same old "YOU CAN'T!" fearful feelings. Still, I am compelled by an instinct that, just as they have at other times in my life, these fears are shepherding me to something important on the other side. I know these women have much to teach the world and myself. At the very least, how to surf. Please check out our trailer and Indiegogo campaign!